In a medium bowl add the tbsp of yeast with 1 tbsp of sugar, then pour the cup of warm water over the yeast/sugar mixture and whisk for a couple seconds. Let the yeast activate and dissolve for about 10 minutes. If the yeast is fresh the mixture will get foamy. In the bowl of your mixture add the flour, start with 5 cups first, salt, the other 4 tbsp of sugar and mix for 30 seconds using your mixer's dough hook. Add the warm milk, egg, vanilla extract, butter and yeast mixture to mixer and mix on low to medium until everything is well incorporated. The dough will probably be quite sticky at first and you will need to add more flour. Add as much flour as needed until the dough comes off clean from the sides of the bowl. It should still be soft and a bit sticky to touch. Lightly oil a large bowl or spray it with cooking oil and place the dough in it. Cover with a clean damp towel and place in a warm spot to let rise until doubled in size. I usually heat the oven to 200 F degrees for about 2 minutes until the oven warms up then turn off the oven and place the bowl in there. The dough usually rises in no time at all, 30 min to 1 hour. After the dough has doubled in size, cut it into 3 equal pieces. Lightly flour your work surface. Working with one piece at a time, roll it out with a rolling pin so that it's about 14 " in diameter. Using a pizza cutter or a knife cut the dough into 16 equal pieces as shown above in the picture. Spread about 1/2 cup of jam, jelly or nutella evenly over the dough. Roll up each piece and place onto the prepared baking sheets. Repeat with remaining pieces. Make sure to leave some room in between the rolls on the baking sheets as they will double in size. Cover the baking sheets with plastic wrap and let them proof in a warm place until doubled in size. 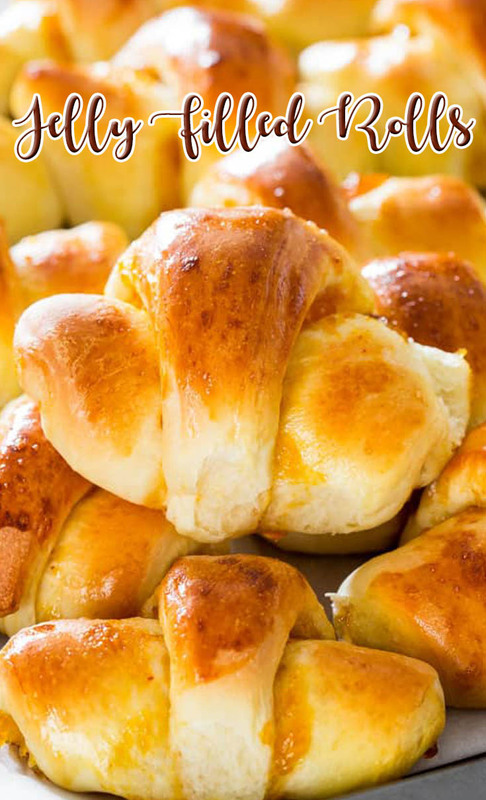 Brush each roll with egg wash.
Bake the rolls for about 20 to 25 minutes or until golden brown.